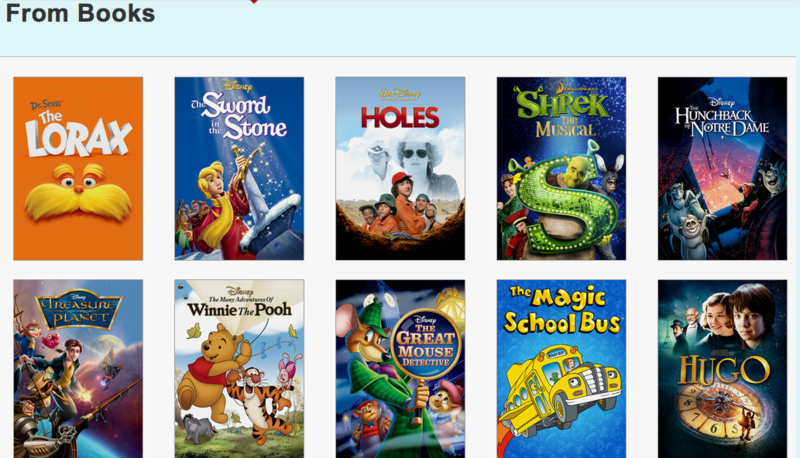 I was initially going to make a blog post of "9 Kids Movies on Netflix Based On Great Middle Grade Books!" because I'm in marketing and we've learned that lists with numbers that don't end in 5 or 0 are most eye-catching and most likely to be clicked. (Just look at the latest Buzzfeed list someone has sent you if you don't believe me.) Netflix is way ahead of my lazy blogging scheme and has already made an entire category of book adaptations you can browse through. I didn't even get a chance to tell you how much you and your kids need to read and watch Holes! Despite this setback, I'm so infatuated by "book to film" as a general topic that I've decided to dig in and tell you all the strange reason why I'm attracted to novel-based-films so very very much. Like many writers, I was an early reader and my parents supplied me with a generous number of books. I was given a time I had to be in bed, but was allowed to stay up long after my bedtime as long as I was reading. So, naturally, I became a bookworm. Even though I read so much, I was alarmingly bad at imagining the setting of all these wonderful stories. The middle grade and young adult books I devoured took place in a strange sort of claustrophobic limbo, where props and characters existed within arms' reach, but hardly any environment surrounded them. The Babysitter's Club met in a tiny blank bedroom where the only props were a bed and a telephone. Matilda visited Miss Honey's cottage, which was no bigger than a walk-in closet. Narnia was just an ordinary place that happened to have a lot of snow everywhere. No matter what the book, the only thing that mattered were the characters who were actively speaking to each other. I don't know how this happened to me. I suppose the location descriptions bored me. I gleefully skipped past those long paragraphs and devoured the fast-paced dialogue and character interactions that were filled with the conflict and language I understood. Meanwhile, the setting in my imagination was left largely unbuilt and abstract. When standardized testing started creeping into my young life, it revealed that my overall reading comprehension was rather deficient, despite the fact that I read more books than most kids I knew. It wasn't until I started watching films based on the books I loved that I began to understand the power of imagining the setting on a much grander scale. The Great Hall of Hogwarts wasn't the size of my school's tiny cafeteria, it was as big as a soccer field! Narnia was an entire country, with mountains and cliffs and rivers worth reading about. The more films I watched based on books that I loved, the more I began to contextualize and value those paragraphs of description that I used to ignore. After watching a film, I could read the descriptions with a better understanding. I soon learned to slow down and imagine the rooms and lakes and skies and forests where the stories took place. Some people complain that a film can't do a book justice, or claim that a film can "ruin" a novel. But film adaptations have the unique power to amplify a book, especially for young readers who struggle with visualizing a certain aspect of a story. For me it was setting. For your kids it might be a certain dialect or characterization that they don't even realize they're ignoring. Pairing books and movies together could be what helps your young readers connect the dots. Letting them watch the movie might feel like cheating, but for me, it was a key that helped unlock my imagination. Are there any book-to-film adaptations that were particularly eye-opening for you or for your kids? What was the first film you remember watching that was based on a book you'd read? Same here! Though lately I've read several books after watching just the trailers for the adaptation. Like, Divergent has been on my to-read list for ages, but seeing the movie trailer before Frozen made it jump to the top! And even when I was younger, I didn't read Harry Potter until I saw the teaser trailer for the first movie. We didn't see many movies when I was a kid, but the novel/movie connection is very important for my own kids. Our house rule for key novels (Harry Potter, Percy Jackson, etc.) is that my kids need to read the book first. Then we watch the movie together. It's fun to hear them discuss what they thought a character or location would look like vs. the movie version. Love this!! I've always been annoyed by people who act like movie adaptations of books aren't worth their time. As a lover of books myself, I get excited to see the world of the book come to life in a new way. First adaptation I remember watching: Anne of Green Gables. And I adored it. I have neither read NOR SEEN Anne of Green Gables, even though it was my mom's favorite. I must add it to my "to read" list! My kids and I recently watched Ender's Game which was a read aloud we did together. What I loved was when my 8yo turned to me during the movie and said, "I didn't picture the battle arena like that AT ALL" and my 10yo then says, "that's exactly how I pictured the battle arena." My children heard my reading and interpreted those words completely differently. We then discussed how everyone's imagination and interpretation is completely different (including the movie director's!) and nobody is right or wrong. This is the beauty of words and how everyone's imagination is unique and special. But I agree with you Ashley. It's so much fun to see how a director takes a book's setting and makes it into a visually interesting movie - whether we like the movie adaptation or not, it's still so much fun!